I really should look back over my blog at how many times I've used that title 'The Perfect Boot'. I don't know, there's never, so far, been an ankle boot holy grail for me; no matter how many times I think I've found it, another pair comes along and declares themselves just that little bit better. When I clapped eyes on these Betty London chelsea-beauts, it wasn't the black pair I was first taken with, but a metallic blue cracked leather pair with a cobalt blue elastic panel. I would have probably bought those if they didn't come in black, just because I really love the shape of these. I have quite narrow feet and most chelsea boots seem to fit a bit 'welly like' because of this. I know you can't really judge by looking but I am hoping that these will be a slimmer fit. 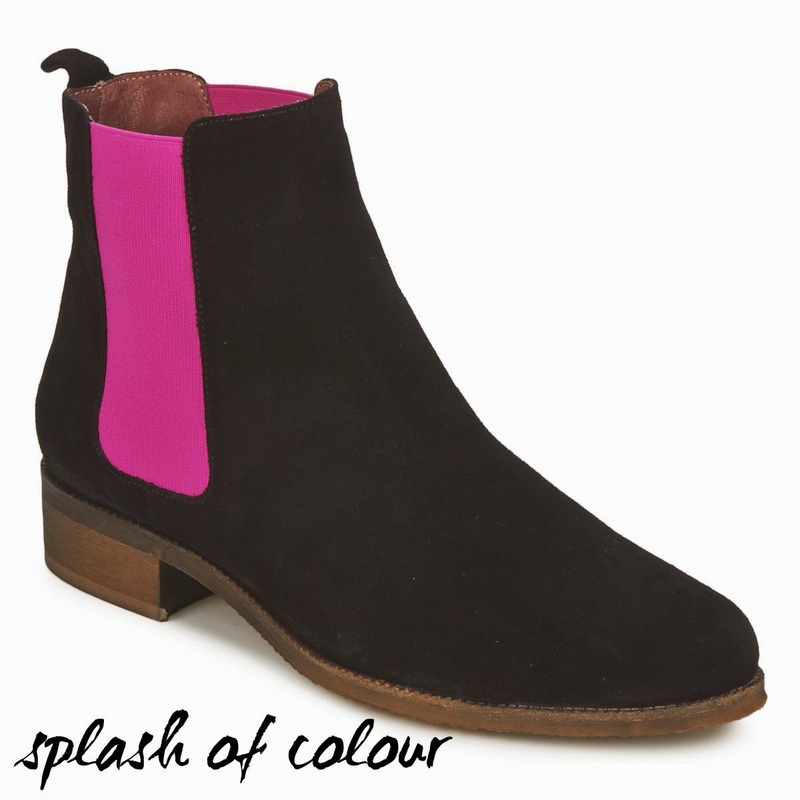 Anyway, finding the black pair soon dashed any metallic dreams of blue suede boots; I know, so boring, I already have a pair of flat black boots, but; the hot pink elastic! so springlike, so pretty! I don't do 'colour' in my day to day wardrobe, really, I'm not sure why but bright tones don't seem to appeal to me so much these days. I'm totally not adverse to coloured accessories now and then, mind you; bringing a splash of colour without the fright factor of a piece of clothing. So that's why these boots really appealed to me. And you never know, if the fit is right, I might always go back for the blue ones....!